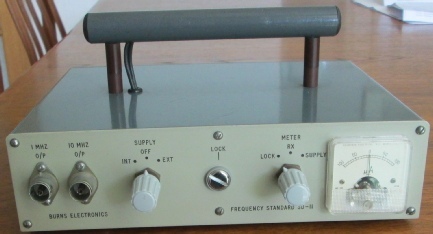 This unit was originally designed to use the BBC 200KHz long wave transmission as its frequency reference but that frequency was changed to 198KHz in the 1980s so significant design changes were required. and then applied to a long time constant network and then to the VCXO. Even with out of lock speed up networks, the lockup time can be thirty or more seconds. 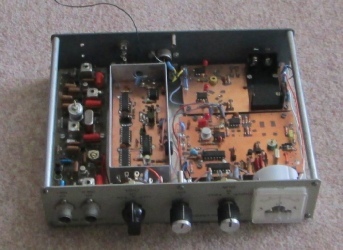 The outputs on the front panel are 10MHz and 1MHz. The internal power supply is a nickel metal hydride rechargeable 8.4v battery with a low drop out regulator to provide 6v for the more critical circuits. A voltage and current limited charger is located on the power supply board that will float charge the battery while the instrument is in use. The following photo shows an internal view during the wiring phase. During testing, it was noted that proximity to the case caused a reduction in Q of the ferrite rod aerial tuned circuit so the carrying handle was raised a further half an inch (12mm) above the steel lid by using longer spacers. The unloaded Q of the ferrite rod aerial tuned circuit is 116. A rear panel switch allows the choice of internal or external aerial. The centre manual lock control has been removed as the digital phase detector circuit is fully self steering. The meter may be switched from the front panel to show the phase lock control voltage, receiver signal level and supply voltage. Whenever an external supply is connected, the battery will be charged until it reaches a pre-determined voltage when the charge will automatically reduce to minimise the risk of damage to the battery. The operational unit is shown below, awaiting some black collet control knobs and a more decorative blanking plate than the 0BA chrome screw in the centre. The centre zero meter is no longer required in this design but was to hand so used with a simple offset network.